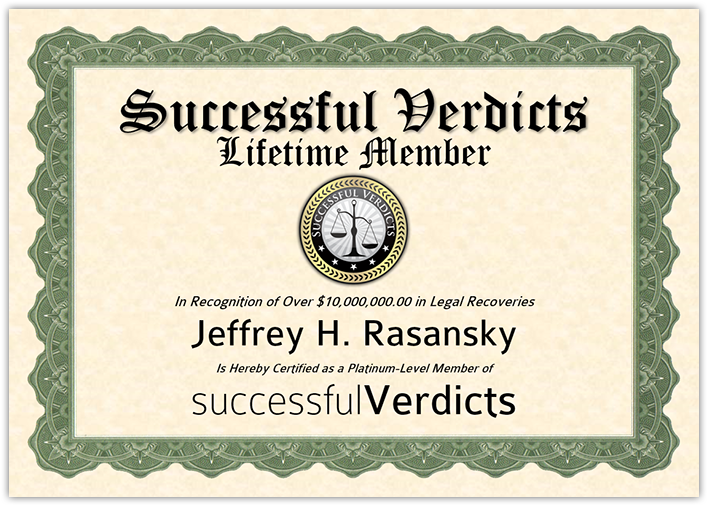 Mr. Rasansky is a SuccessfulVerdicts Platinum Member & Has Successfully Recovered Over $10 Million in Compensation for His Clients. Trial lawyer Jeffrey Rasansky (the founding attorney of Rasansky Law Firm) is an aggressive, dedicated Dallas attorney who prides himself on the level of personal service he gives each and every one of his clients. Rasansky focuses on catastrophic personal injury and wrongful death cases, including vehicular accidents, medical malpractice, brain damaged babies, and product liability, and complex business litigation across Texas and the United States. With close to twenty five years of trial experience, Rasansky has successfully represented clients against some of the largest insurance companies and businesses corporations in the world. Jeff brings a unique perspective to litigation and looks at every detail carefully in preparing his cases. He is creative and thinks outside-the-box. You can be confident that no stone will be left unturned and that all of your legal options will be explored. Jeff utilizes his experience, background and tenacity in fighting for justice for his clients. 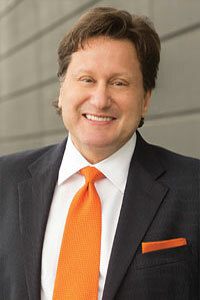 A native of Dallas, Jeff Rasansky earned his law degree at Southern Methodist University (Dedman School of Law) in 1990 after receiving his undergraduate degree from the University of Texas in Austin. Jeff began his law career working for a prestigious national law firm defending insurance companies and large businesses, including hospitals and doctors. During this time, he gained valuable inside experience that now allows him to defeat the biggest insurance companies and largest corporations he once defended. But, after handling these cases, Jeff knew that he could not work for these companies anymore. In his heart, Jeff’s passion was helping others through some of the most difficult times in life. Every day, Jeff tries to make a positive difference in the lives of his clients and utilizes his skills to effect change in corporate policies and procedures. Jeff’s legal wins have been featured in regional newspaper articles as well as national television and radio reports. Mr. Rasansky is often consulted by members of the news media to provide analysis of legal issues, and now, individuals from across the United States call on Rasansky to handle their most important cases involving significant personal injuries and wrongful deaths. Jeff believes in a level of personal service not often seen in his profession. Getting to know his clients and their families and understanding their thoughts, feelings and needs is a hallmark of his approach. As one of his clients, you are considered a life-long friend and are encouraged to reach out to Mr. Rasansky and Rasansky Law Firm with any need you may have in the future. If you are seeking an attorney who will not only stop at nothing to get you what you deserve, but will also provide an unmatched level of personal attention and service, Jeff Rasansky is that man. To schedule a free confidential consultation to discuss your legal matter or injury claim with Dallas trial lawyer Jeff Rasansky, call 214-651-6100 (or toll free at 1-877-405-4313). If you would prefer, feel free to use our online contact form and we will get in touch with you to schedule a consultation. You can also find Jeff Rasansky on Google Plus. Southern Methodist University (Dedman School of Law), Juris Doctorate (J.D. ), 1990, Dallas, TX. University of Texas at Austin, Bachelor of Business Administration (B.B.A. ), 1987, Austin, TX. St. Mark’s School of Texas, 1983. Dallas Trial Lawyers Association (Board of Directors, 2000-2005). Honored by Texas Lawyer as one of 40 Outstanding Lawyers Under Age 40, September, 2001. Honored by D Magazine as one of the Best Lawyers in Dallas Under Age 40, May 2002. Honored numerous times by D Magazine as one of the Best Lawyers in Dallas, most recently in May 2017. Honored as Texas Super Lawyer, 2003-Present. Recognized as one of the Top 100 Lawyers in Dallas Fort Worth, Texas Law and Politics Magazine, Texas Super Lawyers, 2006. Sustaining Life Fellow, Dallas Bar Foundation. Honored by the Texas Access to Justice Foundation with the prestigious Impact on Justice Award, 2009. Named One of the Leading 500 Plaintiffs’ Lawyers in America by Lawdragon. Martindale AV Preeminent Rating (highest rating attainable from Martindale-Hubbell). “Superb” Peer Rating on AVVO. National Trial Lawyers, Top 100 Trial Lawyers. Largest Reported Medical Malpractice Settlement in Texas ($11 million) in 2001, Hamilton v. Baylor Hospital, et. al. Negotiated a settlement of more than $10 million on behalf of an infant who was catastrophically impaired while under medical care. Jeff also successfully represented two other children, one of which resulted in a settlement of 4.5 million dollars and another for 2.0 million dollars. Earned a $1,019,000 settlement after a jury found in favor of the family of a person who died during elective eyelid surgery. Earned a $1.2 million settlement on behalf of the family of an Alzheimer’s patient who died when she became entangled in a hospital bed rail. Obtained a $2.5 million recovery following a labor and delivery procedure that resulted in a severe brain injury to a newborn infant. Recovered $825,000 after an elderly nursing home resident died from an infection in his subclavian catheter. Earned a $250,000 settlement on behalf of an elderly pedestrian who was the victim of a hit-and-run accident in a parking lot of a retail establishment. In 1995, Jeff founded Rasansky Law Firm. Jeff’s dedication to every one of his clients, coupled with his willingness to do everything in his power to secure the best possible outcome for you, the client, has earned him the respect of his peers and those he has had the pleasure of representing. Over time, Jeff parlayed his reputation for successful results, professionalism and superior skills as a trial lawyer to grow Rasansky Law Firm into one of the most prestigious personal injury law firms in the country.